Every year we hear and greet people with “Have a Safe Diwali” but are these words enough to keep us safe? No, it’s good to tell people to have a safe Diwali but everyone should take certain precautions to actually make it safe. We all get carefree while enjoying the celebrations and let go minor things happening around but that’s when we go wrong, even minor things can lead to big accidents. However, ensuring a safe celebration is a must. Read through for tips to celebrate this Diwali safely. First of all, bursting crackers is something you should stop doing as it’s harmful to everyone but there are certain people who really enjoy bursting them including children and adults. To avoid any accident with fire it is recommended that you wear cotton clothes and stay away from synthetic material even if you are playing around with “fuljadi”. You should buy fireworks from legitimate makers andensure that you go through the instructions before actually bursting them. Great quality fireworks diminish the danger of a hazardous incident. Before taking your kids out in the open to burst crackers, it is highly important for you to train them about the use of fireworks and instruct them about the proper approaches to do as such. Supervising them while they play around and have fun with crackers is of utmost importance. 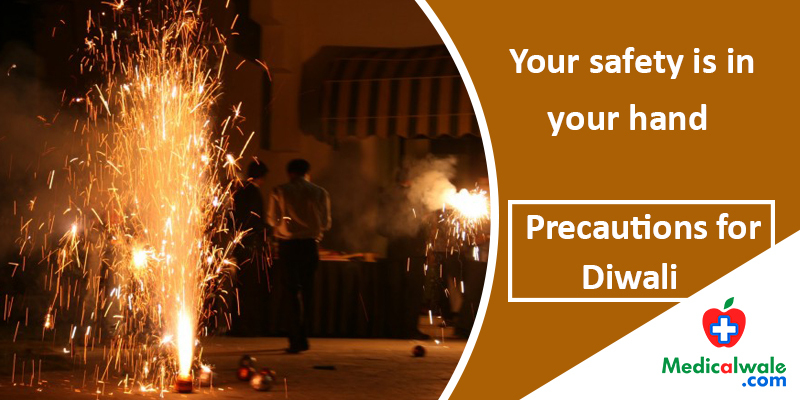 Having a fire extinguisher in close proximity to the area where you are bursting firecrackers is very essential. Even a bucket of water or sand would be useful to tackle an unexpected fire. It is basic to take note of that you should never blast firecrackers in a closed area. Doing as such can prompt a gigantic danger in case of fire breaking. A first aid kit ought to be helpful while you or your children are enjoying the fireworks. On the off chance that there is minor damage, it tends to be dealt with quickly at home. Discard the utilized sparklers quickly and deliberately. You can either place it in a container loaded with water or put sand on themin order to put out its heat. Diwali is about lovely candles and diyas spreading their light and joy. However, keeping lit candles and diyas at home can cost you dearly at times. You should ensure that any curtains or inflammable materials are not near them. Pets are a part of the family and we love them equally. Diwali can be a horrifying time for the creatures because of the extraordinary commotion all around. Try to sensitize your pet to the noises by playing similar sounds beforehand. Also, try your best and don’t let them stay alone and do keep them away from firecrackers. It is vital to commend celebrations with the most extreme affectability and care. Utilizing fireworks that don't make a great deal of a lot of noise can be the first step towards being sensitive to your fellow neighbours and friends. Too much noise pollution can be hurtful for everybody, particularly senior residents. Festivals can be hectic and its obvious one may run out of enthusiasm and also the energy and will to work. There are too many little objects to be taken care of, and a smooth execution is not possible without efficient teamwork. Remain hydrated all the time by methods for water, juices or different liquids. You without a doubt don't wish to black out and add to the effectively existing confusion. Spread happiness this Diwali and celebrate this beautiful festival joyously with your loved ones and keep them and yourself safe.